Project Hello Stranger | What does it take to make someone's day? What does it take to make someone's day? Hello Strangers, It is TWENTY THIRTEEN! Hello new friends, old friends, and beautiful strangers! 2012 has been an amazing year for us. I dont think we have to even explain why, you guys know it. You made our year so amazing! Giving us loads of opportunities to share our cause, participating ever so actively (despite how inactive we were at times) at our activities, emailing us tonnes of encouraging notes, FB msging us ideas, suggestions, feedbacks, or just words of care. This year will be another journey for us. We’ve expanded with new members! 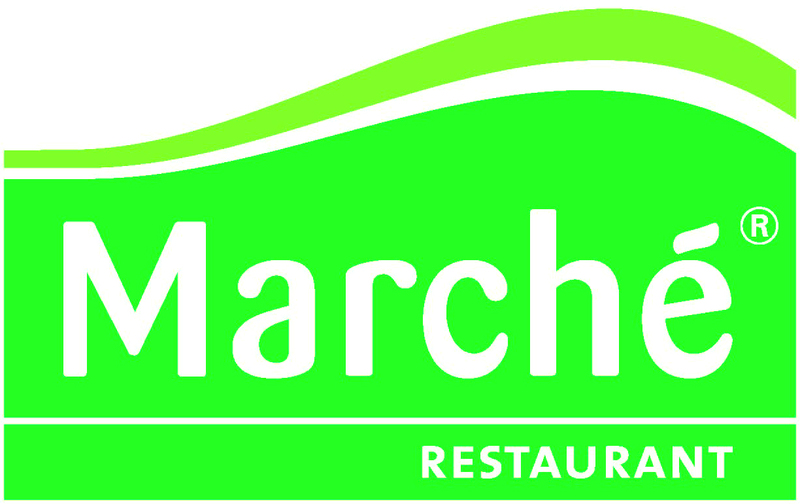 Changed our logo! Everything is going great. Continue to observe our platforms (FB/ Twitter/ here!) and I promise I will be a more diligent blogger documenting our adventures here! Till the next hello stranger moment moment! 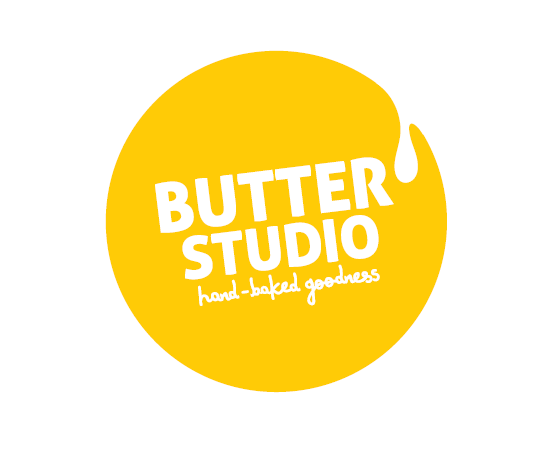 Hello Stranger: We are Expanding! It puts us into great embarrassment and honour to know that there are people out there who actually want to join us! Despite the long hiatus and the numerous excuses we make, there are real people who have emailed us for our recruitment. Definitely our biggest honour. Those who havent heard the news (where have you been! ), Project Hello Stranger is recruiting! We are short of manpower (and womanpower) and creative juices so please if you possess the following characteristics and are keen to step out of your comfort zone to make a difference in Singapore, do let us know! If interested, email us with these necessary details! HELLO STRANGER, We are still HERE! Its been so long, we hope we are not classified back as strangers to you guys again! It has been a whirlwind of chaos here, with so much stuff to do, so much work to handle, gosh, we cant even catch out breaths, tough tough times. Okay, we kid! We were just plain ol’ lazy. Everyone deserves some lazy moments. That said, have you been putting in effort in your daily routines to break down barriers between strangers? We may not be hosting campaigns and making videos but we sure are still doing little bits of barrier breaking in our usual lives. 🙂 We sure hope you are too! 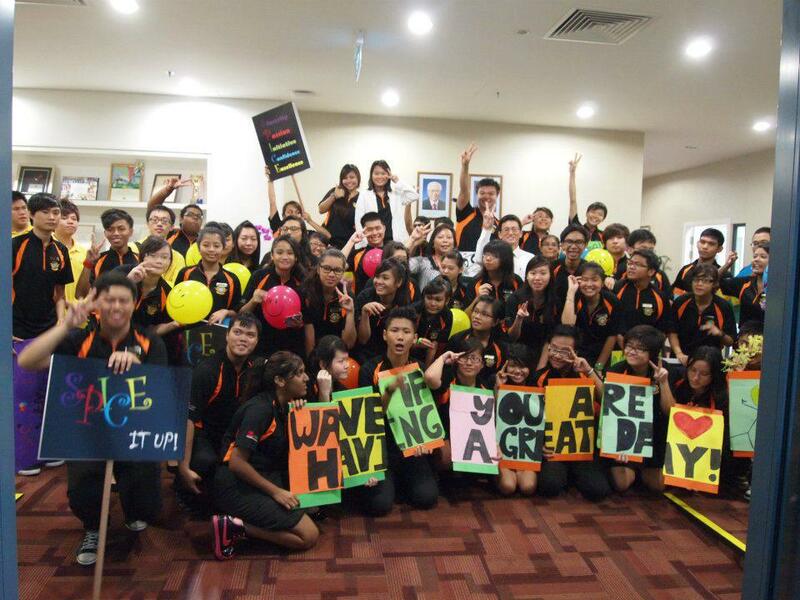 ITE CCK did “Wave if You Are Having A Great Day!” to welcome back their schoolmates. 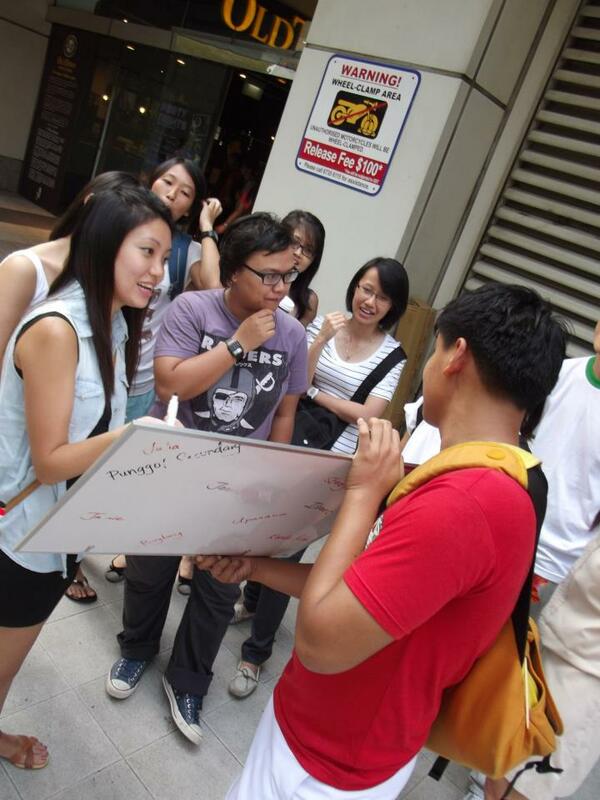 SMU Rotaract Club did a mini Hello Stranger stint during their orientation camp. We promise you this is not the end of PHS. Coming up early Nov, we are looking to have one of those tiny yet straight to the point of breaking barriers campaign. However we are in need of videographers and also a video editor. If you are a happy person (with those necessary video skills! ), please email us at project.hello.stranger@gmail.com to ask for more details! 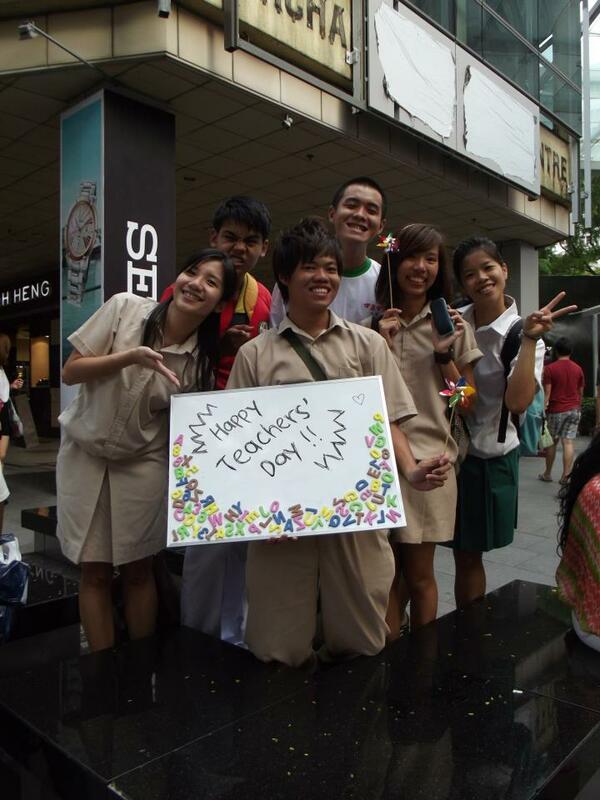 Hello Stranger wishes all a HAPPY TEACHERS’ DAY! 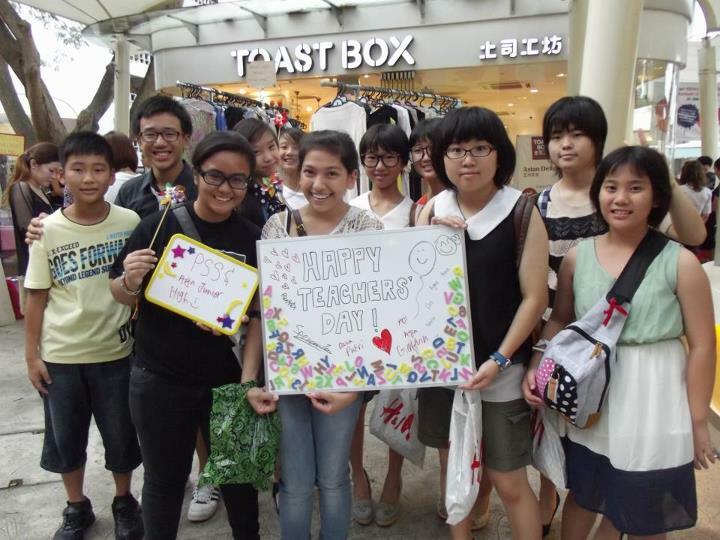 A tiny bunch of us headed out last Sunday on a very important mission- to let the shoppers along Orchard Road know that Teachers’ Day is around the corner (I bet you, working adults have no idea at all!) and to get people to take photos with our self-decorated whiteboard and pledge to salute all teachers’ and their amazing work in grooming all of us. For Project Hello Stranger, most of us are out of school and we do miss being in school quite alot and when we think back about our schooling days, there will always be a teacher who had touched our hearts so much that we still remember him/her many years down the road. If we did not have teachers, the world will be a terrible place and Project Hello Stranger will probably not exist as well. So Kudos to you teachers for nurturing us and imparting knowledge into our tiny minds, for being ever so patient and for losing your voices again and again, for waking up earlier than us and knocking off late just to accommodate our consultation slots, for disciplining us and forcing us back on the right track despite all the childish hatred we had for you. Your love is unconditional and here’s a BIG hug for all of you (Project Hello Stranger style)! 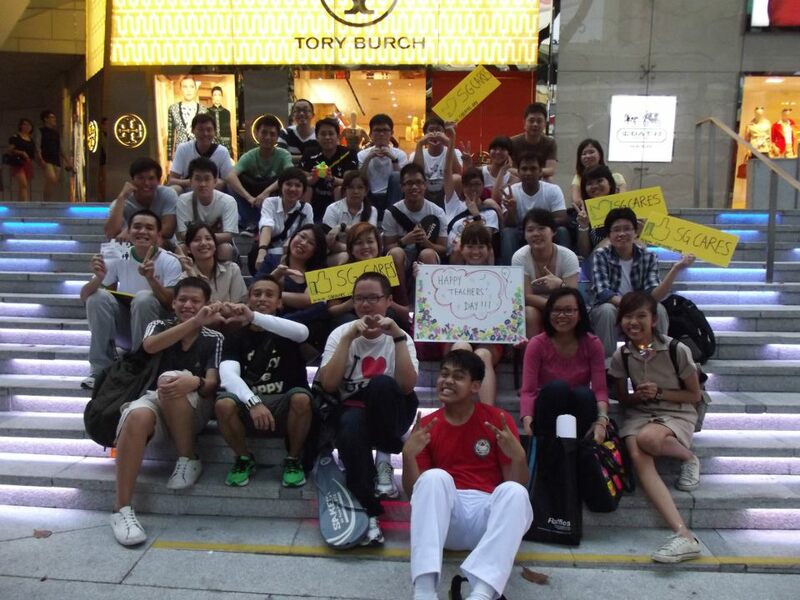 Happy gathering! So once again, we got the old bunch and new bunch of strangers down to NVPC for a gathering and a little updates on the knick knacks that are going on in our brains. Bought some donuts, made sure everyone was on a sugar high, and we had a ball of fun. Not forgetting the random Korean MTV we played that got a few of us dancing to a random beat. For those who couldnt make it last Friday, fret not, sweat not, forget us not, we will publish all the little plans we have in a jiffy. At the meantime, if you are a student and you are reading this, heads up! 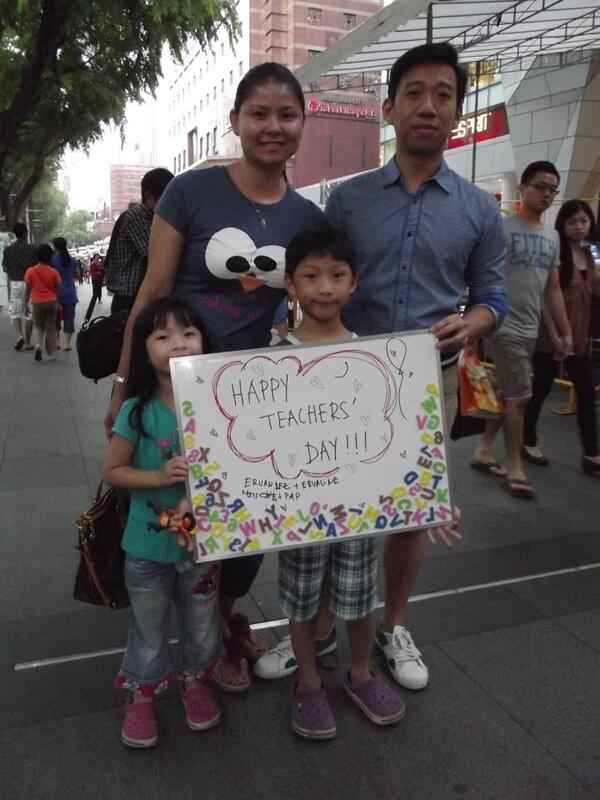 We are calling student bodies to be a part of a mini Teachers’ Day campaign. Not much you have to do on your side, really, but the experience will definitely be a part of your memories of school. Besides that, your teachers will be surprised. Okay thats all we can say, just in case a teacher is reading this. If you are interested to know more, email us at project.hello.stranger@gmail.com. Top secret. We are actually not too good at keeping secrets. Ha. Seriously, this is so tough! HELLO STRANGER! WE ARE BACK! We are back with a swoosh (cause bang is too mainstream)! We are once again here to discover new grounds, run new campaigns, try out new stuff, bump into new obstacles, make new friends and basically crave our way to meet our objectives. To start things off, we are inviting you to a gathering to catch up and to be merry and also to hear about our new plans! We want to run these new ideas with you first before we launch it all over our platforms. We are honestly bursting to share with you what lies ahead. Hello Strangers, Were you Blown Away? HELLO HELLO! 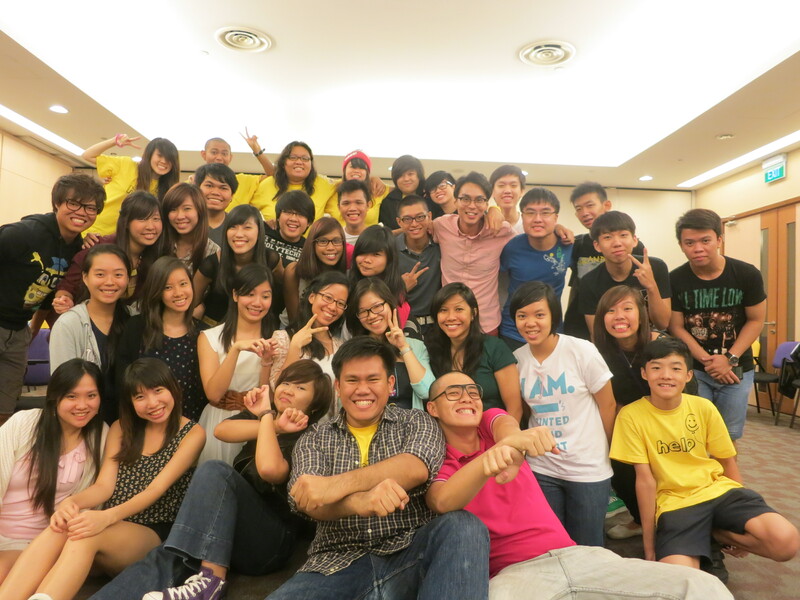 It has been a good 2 weeks since Blown Away happened but the team is still reminiscing how awesome the whole event felt. 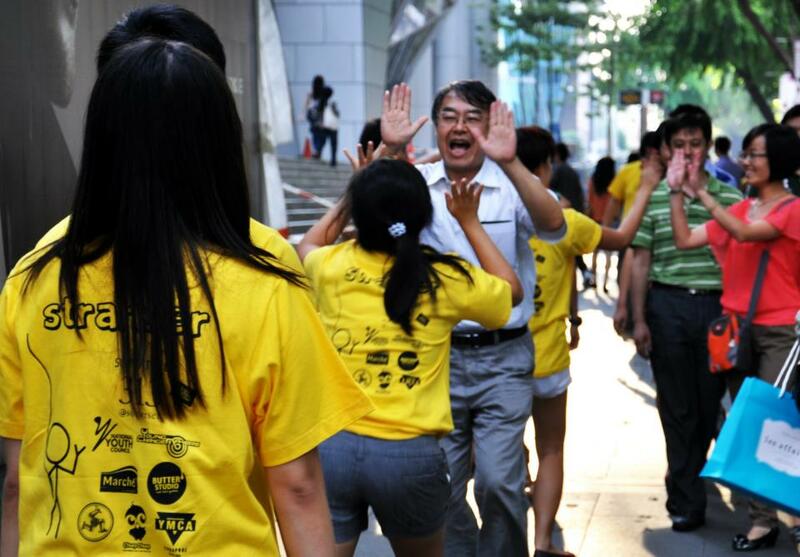 Of course, self praise is definitely no praise but we cant help but feel our hearts heat up when we look through photos of how strangers gave our ambassadors high 5s/ fist bumps, happy kids and families with our balloons and how our enthusiastic ambassadors gave their best shot at interacting with strangers. Now just looking through numerous facebook notifications of how our ambassadors have made friends with each other makes us even more smiley and satisfied. What commands success in an event? Were our KPIs met? Wait, did we even set KPIs? Ha. Besides that, success also means development in the team. The team has learnt so so much planning this 1 day event. All from the nitty gritties like getting quotes, negotiating with suppliers, handling a pool of volunteers, meeting obstacles and solving them, settling the flow of the event, preparing the logs, managing the media, we have learnt a heaven lot. We broke out of our shells and met so many new friends, I dare say, this is the most number of friends one can actually make in such a short while! We are youths finding out way through this semi-blindly as well so we are extremely happy after the event. This is our form of success too. Now that we have Ballooned Away, what’s on our plate, you may ask. We just had a meeting 2 days back and just like a bunch of typical bananas, we kept on yakking about the many things we wanna do. Now we need to streamline it and piece everything together. Give us sometime, plans will be out soon. An honor roll dedicated to our very kind and generous sponsors- be it product, venue, money or anything at all, we are very thankful for this help. Without the boost that you guys gave us, this whole show cannot go on and our project will be just hanging in mid-air. With you guys, everything was made possible. 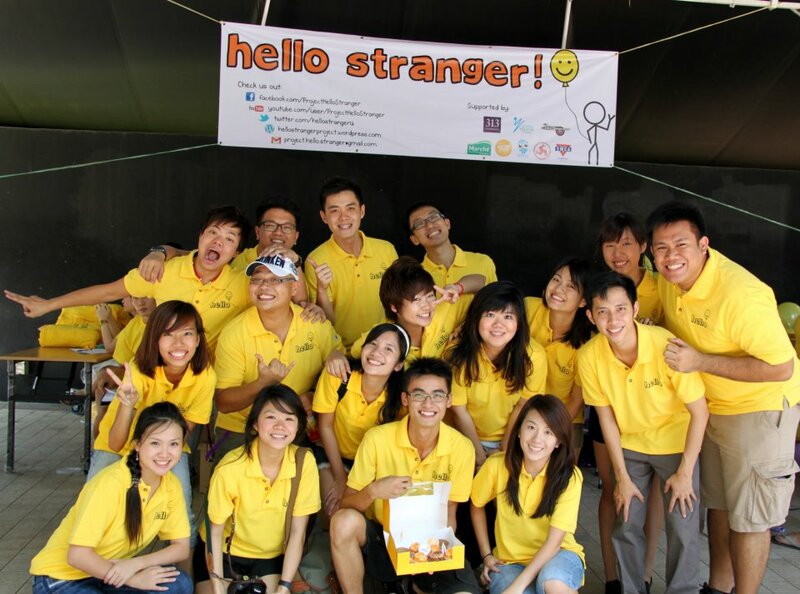 So here’s from all of us at Project Hello Stranger, thank you so so so much! Today is the day! It is the day we are ready to change the culture in Singapore. 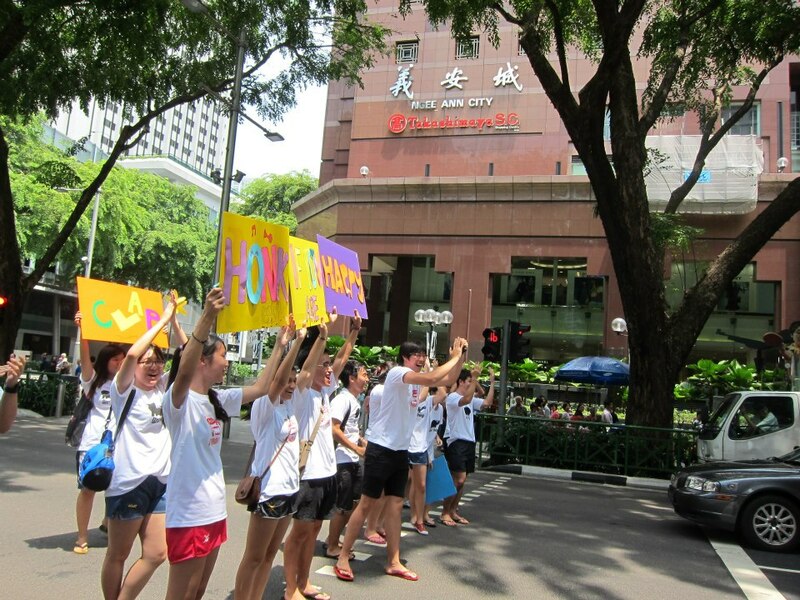 One step at a time, we will be closer to the Singapore we want to see in the near future! Can you believe this day has finally arrived? So if you are heading town for a romantic date or going to savour the last bits of the Great Singapore Sale, hop on by our booth at 313 (near Charlie Brown) to say Hello to our team and learn more about us personally. 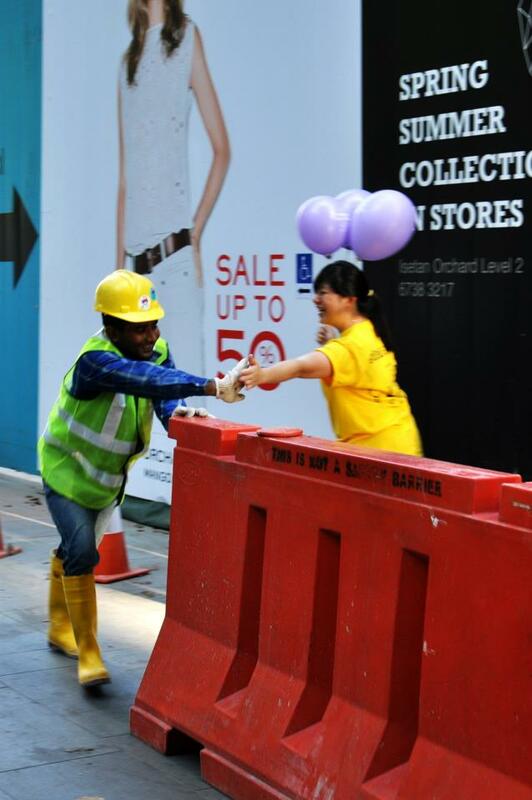 And of course, if you receive a happily coloured balloon, pass it on to a stranger! 🙂 Lets all make new friends today! Tweet us/ Facebook us, engage us in conversation! 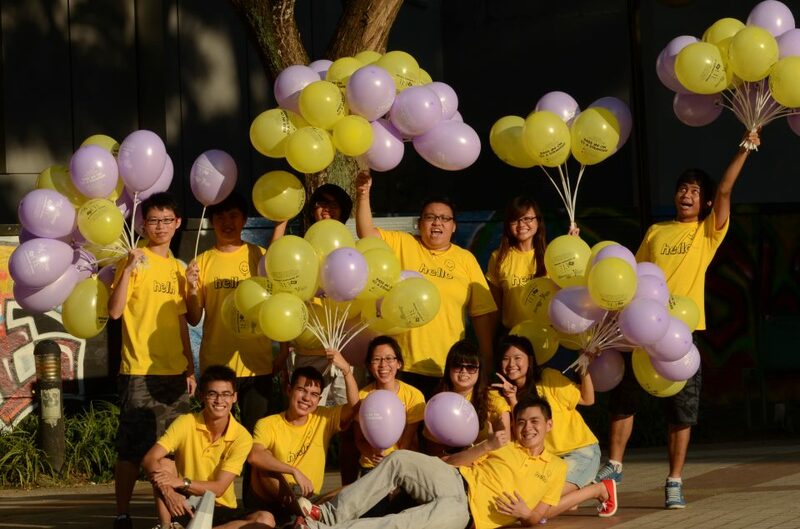 Upload photos of you with our balloons! We will be logged on the whole day so do speak to us! Alright! Time to set up and wait, what! No time for breakfast? Hello Strangers, Hello Lian He Zao Bao! We always mention how surprised and amazed we are every time an article appears in the papers. You must be thinking, “did you go for the interview?” At the interview, it is always a simple comfortable chat, very casual, no frills, alot of spills. Little did we know, this is how big the article will be! 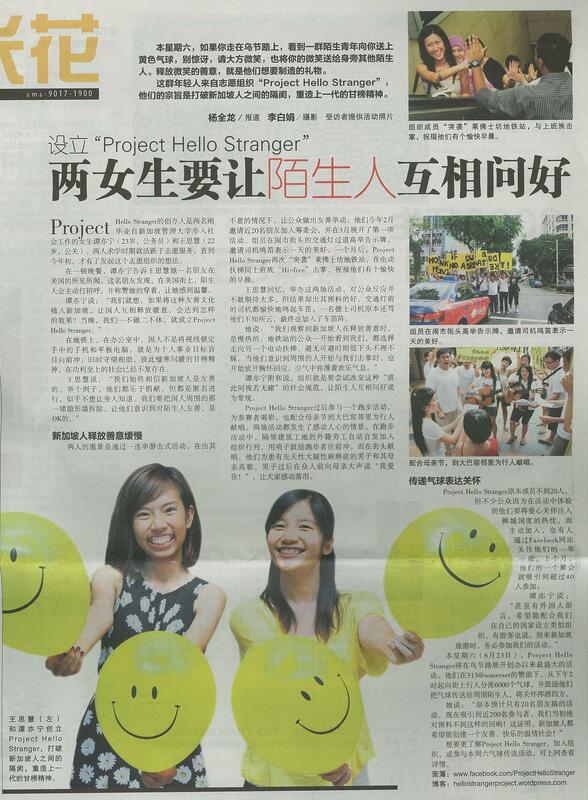 This Lian He Zao Bao article in the popular section “Popcorn” is almost the entire page of the papers! WOW. We are very touched by reporters/ journalists who feel for the project and give us a very nice slot in the papers to help us inspire more people. 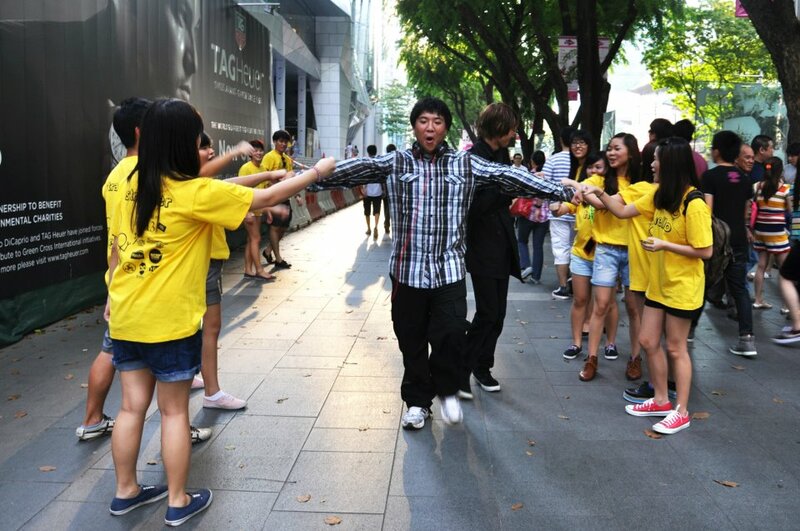 See, Singaporeans are really nice. 🙂 This is definitely an adrenaline pill popped into our mouths. Our hearts are pumping so hard and our minds are going crazy with enthusiasm. Imagine a thousand F1 race cards speeding across our heads. Ya. Exactly. So lets see how many days are we left with?